In electronics, an avalanche diode is a diode (made from silicon or other semiconductor) that is designed to experience avalanche breakdown at a specified reverse bias voltage. The junction of an avalanche diode is designed to prevent current concentration and resulting hot spots, so that the diode is undamaged by the breakdown. The avalanche breakdown is due to minority carriers accelerated enough to create ionization in the crystal lattice, producing more carriers which in turn create more ionization. Because the avalanche breakdown is uniform across the whole junction, the breakdown voltage is nearly constant with changing current when compared to a non-avalanche diode. The Zener diode exhibits an apparently similar effect in addition to Zener breakdown. Both effects are actually present in any such diode, but one usually dominates the other. Avalanche diodes are optimized for avalanche effect so they exhibit small but significant voltage drop under breakdown conditions, unlike Zener diodes that always maintain a voltage higher than breakdown. This feature provides better surge protection than simple Zener diode and acts more like a gas discharge tube replacement. Avalanche diodes have a small positive temperature coefficient of voltage, where diodes relying on the Zener effect have a negative temperature coefficient. 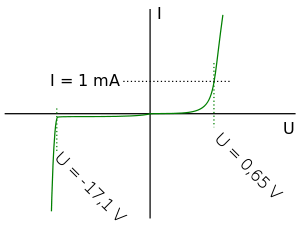 Avalanche diode current vs. voltage characteristic. The voltage after breakdown varies only slightly with changing current. This makes the avalanche diode useful as a type of voltage reference. Voltage reference diodes rated more than about 5.5 volts are generally avalanche diodes. Zener diodes are used to protect electronic circuits against damaging high voltages. The avalanche diode is connected to the circuit so that it is reverse-biased. In other words, its cathode is positive with respect to its anode. In this configuration, the diode is non-conducting and does not interfere with the circuit. If the voltage increases beyond the design limit, the diode goes into avalanche breakdown, causing the harmful voltage to be conducted to ground. When used in this fashion, they are often referred to as clamping diodes or transient voltage suppressors because they fix or "clamp" the maximum voltage to a predetermined level. Avalanche diodes are normally specified for this role by their clamping voltage VBR and the maximum amount of transient energy they can absorb, specified by either energy (in joules) or . Avalanche breakdown is not destructive as long as the diode is prevented from overheating. Avalanche diodes generate radio frequency noise. They are commonly used as noise sources in radio equipment and hardware random number generators. For instance, they are often used as a source of RF for antenna analyzer bridges. Avalanche diodes can also be used as white noise generators. If placed into a resonant circuit, avalanche diodes can act as negative resistance devices. The IMPATT diode is an avalanche diode optimized for frequency generation. These are made from doped silicon and depend on the avalanche breakdown effect to detect even single photons. The silicon avalanche photodiode is a high gain photon detector. They are "...ideal for use in high speed, low light level applications." The avalanche photodiode is operated with a reverse bias voltage of up to hundreds of volts, slightly below its breakdown voltage. In this regime, electron hole pairs generated by the incident photons take a large amount of energy from the electric field, which creates more secondary charge carriers. The photocurrent of just one photon can be registered with these electronics devices. Wikimedia Commons has media related to Avalanche diodes. ↑ Advanced Photonix, "Archived copy". Archived from the original on 2011-12-21. Retrieved 2011-12-10.